At Honey Creek Farm, Tim Carter is turning dirt back into soil. In 1974, Tim came home from Purdue to the family farm with the vision for America's "big ag" that was being taught in ag classrooms everywhere. Through the 80's he followed after that plan. It's what the USDA said would be the future of food: confinement livestock, large-scale grain, genetically-engineered crops, and chemical combinations. After two decades of that plan, he started to notice that the rich black soils his father had left him on their third-generation farm were turning sandy, hard, and lifeless. Industrial farming was converting rich soil into mere dirt—and, yes, there is a difference. What's the difference between Dirt & Soil? Dirt is nothing more than tiny rocks (sand and clay) and decayed plant material. Dirt alone is dead. But soil is more than dirt. Soil is alive with microbial growth. More than just dead organic matter, it's rich with the fungus and bacteria that break such organic material down. A mere teaspoon of soil contains millions of organisms and hundreds of species. All that life has the capability to retain moisture and nutrients that dirt simply cannot hold. Crops planted in soil are healthier, require less fertilizers, and are more drought-resistant than mere dirt. 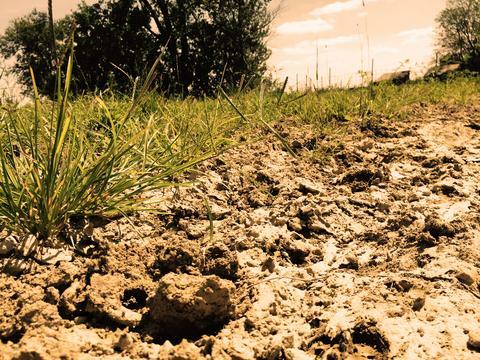 So, what's happening to our soils in the Midwest? As it turned out, the future of food might be the end of soil. Industrial-scale agriculture requires frequent tilling to manage monoculture—a single crop grown year after year. Exposing that living soil to years of tillage, chemical applications, and monoculture will slowly kill off the cornucopia of life that makes soil. In just a couple of decades, you'll have what Tim found all over his farm: mere dirt where there once was soil. The solution drew jeers and sneers from farmers in the 90's. Tim was among the first farmers in the country to adopt "no-till" farming—never plowing the fields under to start a new season. Letting the dirt stay intact allowed fungal networks to sustain. One fall's stalks decayed while the next spring's seeds sprouted. Today, Honey Creek Farm has been untouched by a plow for over 25 consecutive years. As the harvest comes and goes, the cover crops peek through the soil just as winter sets in. Just when you might think the fields are in lifeless slumber until spring, a hungry herd of cattle comes foraging. And as they forage, they drop steaming piles of future-soil in their path. Today, Honey Creek Farm is a biodiverse ecosystem. Corn and soybeans are still harvested off a portion of the soils every fall. But in between, a menagerie of soil-makers do their work. Cover crops breaking down their dead predecessors into more soil, the cattle munching on their leaves, poultry scavaging for insects while dropping nitrogen-rich manure, and when the soil needs a particularly thorough "tilling," the hogs are turned loose to root deep into the earth in search of grubs. Their subterrainian foraging instincts are naturally oxygenating to the soil, and they drop their own manure all the while. Farmers like Tim all over the Midwest are turning dirt into soil, and soil into food with pasture-based, permaculture farms that boast diversity of life and natural processes. You can shop local farms and pasture-raised meats on Market Wagon, and support your local economy and ecology at the same time.